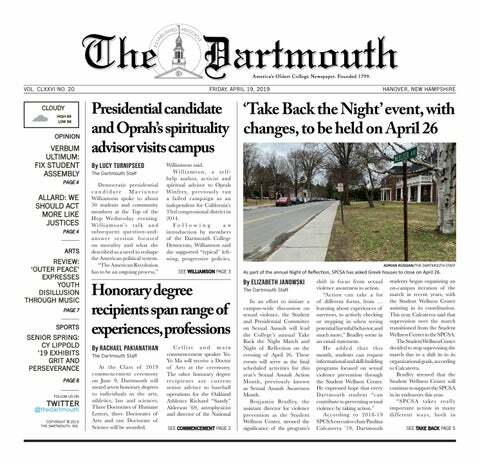 Joyce added that the Dartmouth Bystander Initiative is a consequence of Greek leaders’ decision to address concerns regarding the safety of Dartmouth students. To ensure that the principles of the program are heard, the Greek Leadership Council requires that students interested in becoming members of Greek organizations attend a session facilitated by the Dartmouth Bystander Initiative. At the Dartmouth Bystander Initiative overview session, students discussed the nature of incidents related to sexual violence and alcohol at the College, according to Jenna Gallagher ’21, a member of Sigma Delta sorority. The session also discussed ways students could step in to help their peers in threatening situations. Gallagher explained that she was not confident that mandating students to attend one session would change anything. Before starting their first year at Dartmouth, students were required to complete a course in sexual assault prevention. She said that, despite this required training, she was aware that some students still dismissed the ideas taught and “felt entitled” to disrespect women. While Greek leaders have emphasized the importance of bystander intervention, the financial accessibility of Dartmouth’s Greek system has also drawn recent attention. This year, several Greek houses made sure to highlight the financial support available to prospective new members. While Gallagher said there are still problems with diversity and inclusivity in the Greek system, she said she believes Greek houses have begun to make more concentrated efforts to be inclusive. According to Gallagher, she felt immediately welcomed and valued by her sisters at Sigma Delta when she joined this fall. “I didn’t really have that weird transitional period that I thought I would as a new member,” Gallagher said. “I immediately felt like it was my space, and I was a part of the house.” She added that being in Sigma Delta affords her the opportunity to experience a female-dominated social space. Sisters are able to feel at home in a Greek space, unlike the typical freshman experience in male-dominated fraternity basements, according to Gallagher. Anderson said he felt a similar sense of camaraderie during his time in Psi Upsilon. With a class of 24 members, he was able to forge “incredibly close relationships” with his brothers. Anderson added that the inclusivity of the Greek system at Dartmouth sets it apart from others around the country. While Dartmouth’s Greek system remains a pillar of the College’s social life, it continues to face significant criticism. Conversations surrounding sexual violence, hazing, high-risk alcohol consumption and mental health point to the Greek system as a source of these issues. According to Joyce, the Greek Leadership Council has made efforts to counteract the stigma associated with Greek life on campus. Last year, the College joined the Hazing Prevention Consortium, a data-driven prevention model, in order to better understand hazing attitudes and behaviors at Dartmouth. In addition to the Hazing Prevention Consortium, members of the class of 2022 were invited to attend an introductory panel to prepare them for going out in Greek spaces this year. The panel, which saw extremely low turnout from freshmen, intended to discuss acceptable behavior in Greek spaces. Joyce added that he appreciates that “we’re being critical of where our system is at and continuing that conversation.” This past summer, the group hosted a community discussion about topics such as the perpetuation of toxic masculinity at Dartmouth.